Just after Christmas, my dad and I drove through the Lake Apopka Wildlife Drive. The forecast said “overcast.” The humidity level was 100%. It was about 45 degrees out. But any day that you go birding is a great day, right? 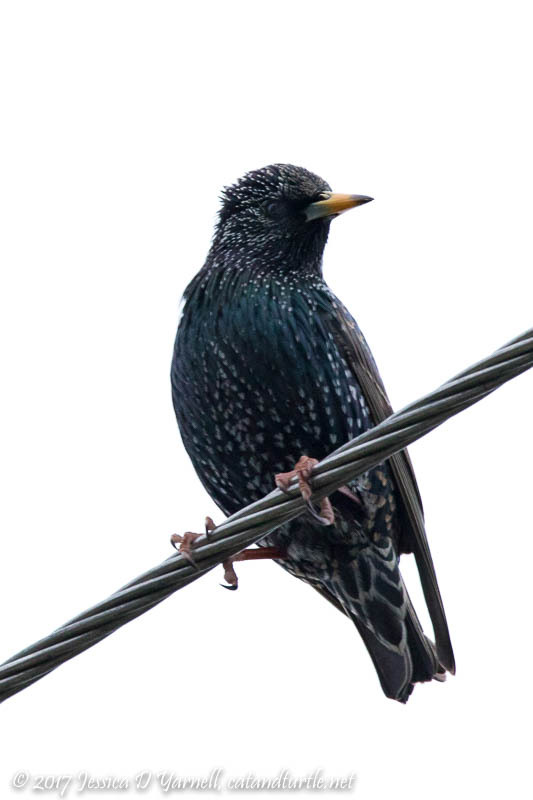 Our first photographed bird of the morning was a European Starling, calling repeatedly from the top of a power line. He was kind of pretty in his own way. Our target bird of the morning is the local celebrity, the female Vermilion Flycatcher. 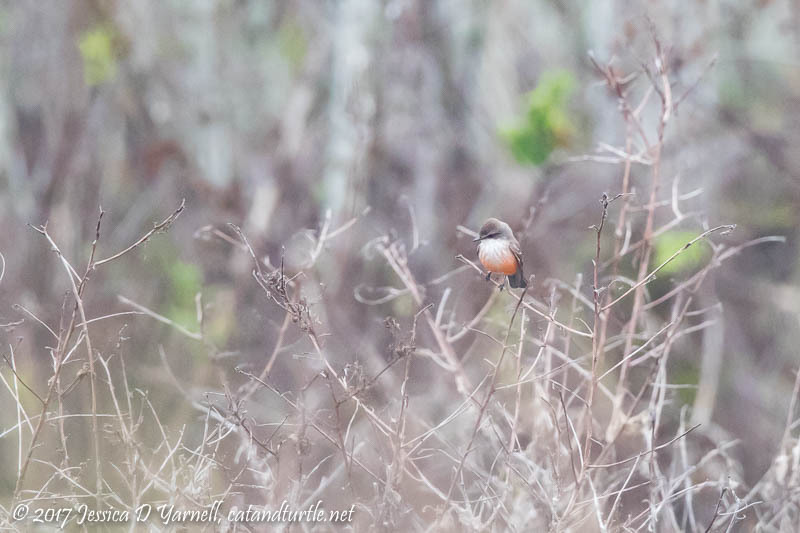 Vermilion Flycatchers are rare in Florida. Their normal range extends from the southwestern United States into Mexico, and also South America. This female bird has been seen regularly at the Lake Apopka Wildlife Drive since it re-opened in late December. She hangs out at the “Crazy U” (the strange jut in Lust Road at the Conrad Road intersection). My dad and I spotted her far out in the trees. She basically looked like a white blob with a red tummy. 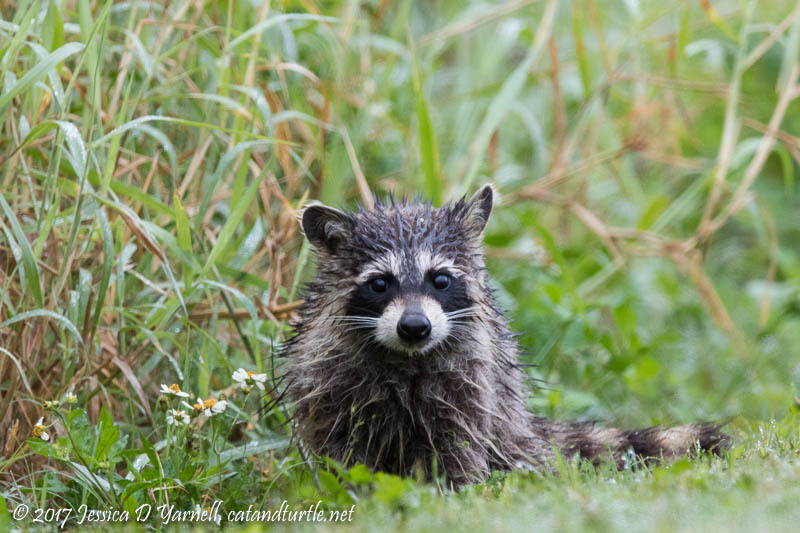 We stood watching her for a while, hoping she’d come closer. Then we realized that the thick fog had turned into mist, which made the day even colder. So we headed back to the warmth of the car. The ducks are in town for the winter. A few of them were fairly close to the road, like this Northern Shoveler. 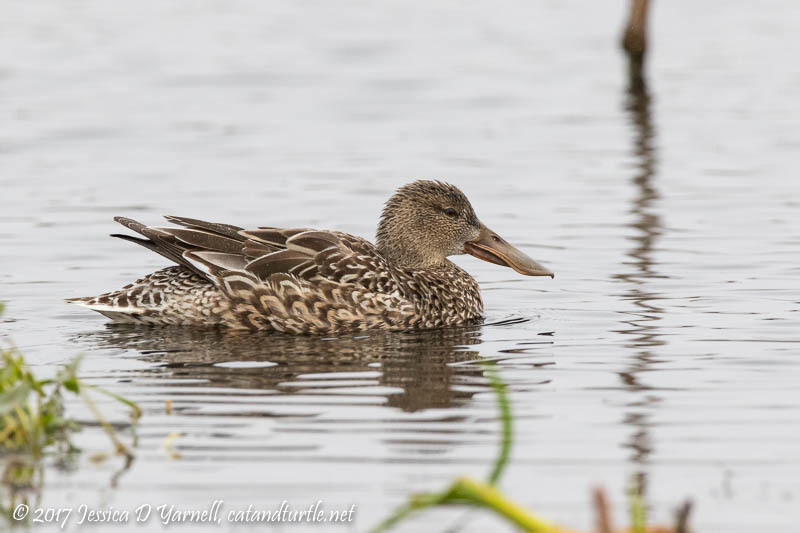 The shoveler’s beak is fairly distinctive among all the Florida wintering ducks. 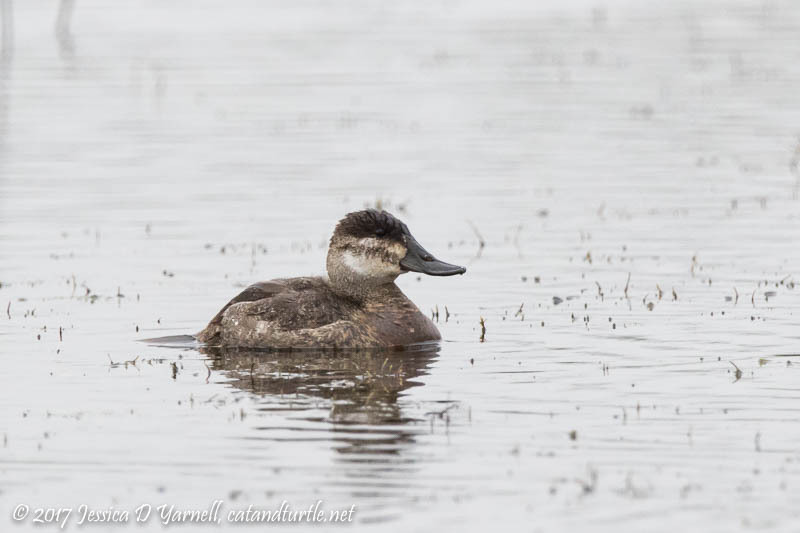 This little Ruddy Duck looked as cold as I felt. Ducks are more fun to photograph when it’s sunny outside and their feathers glisten with color. These ducks were just floating on the water, not even dabbling for food or giving me a wing-flap. Silly birds. 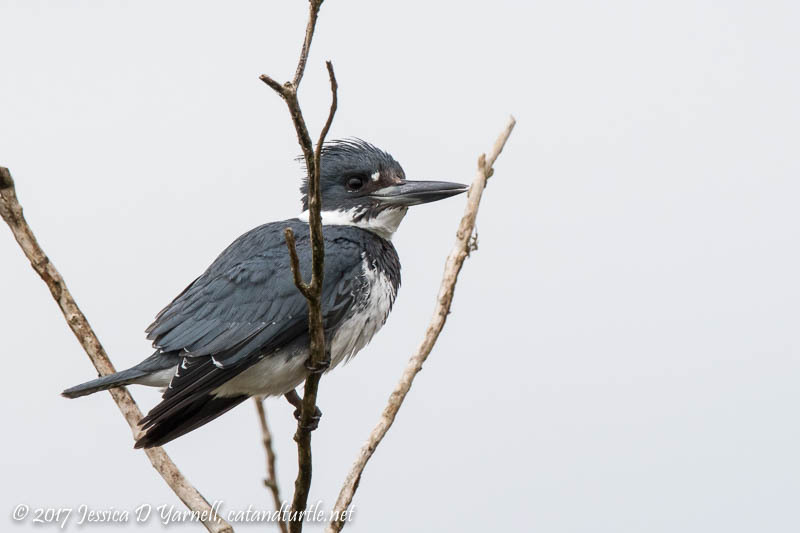 The LAWD is full of Belted Kingfishers during the winter time, and this morning was no exception. This male kingfisher cooperatively posed on a branch not far from my window. You can tell he’s a male because he lacks the rusty colored bars on his chest. ⟵Hoodies Back in the Neighborhood! The drive is open! Yay! I’m in New Mexico filling memory cards and making memories with my son and would love to see 48 degrees. The comments worked! Yay! Enjoy the time with your son and I’ll look forward to drooling over your blog posts from your trip. We will be visiting Daytona Beach in July and I am looking forward to checking out some of the birding sites near Kennedy Space Center.